Full color 7 1/2" x 11 1/4" ad for the taste of Chesterfield. The ad has a picture of a couple smoking cigarettes while they run their yellow speedboat across the gentle waves of a blue bay. The ad headline says "-refreshing mildness - better taste all the way Chesterfield wins". Full color 8" x 11 1/2" ad for the cigarette that was called the "Spirit of '38". The ad has a picture of an attractive young lady who is marching and playing a drum as she strides by in clothing that looks like it was during a convention of colonial soldiers. The ad says "fall in with the army of happy soldiers who know that Chesterfields milder and better taste really satisfies". 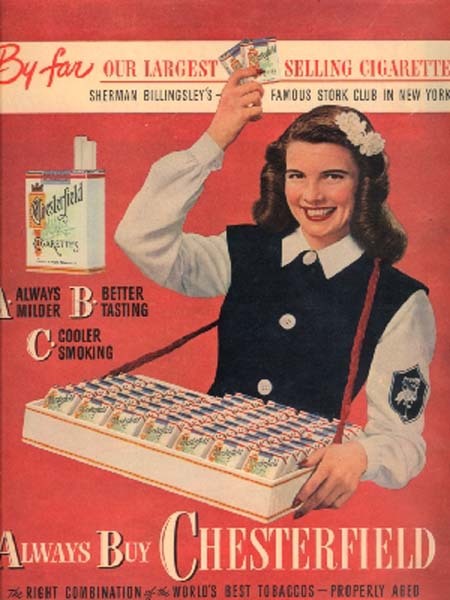 Under the picture of her it states "Chesterfield...the right cigarette for more pleasure"
Full color 9 1/2" x 13" ad with the Girl of the Month Patsy Garrett marching in a parade all dressed in green with packs of Chesterfield attached to her belt. The ad headline says, with an Irish lilt, "Sure an' the Big Parade's to Chesterfield". This ad is larger than my scanner bed so the outer edges of the ad will not be visible in the scanned view. 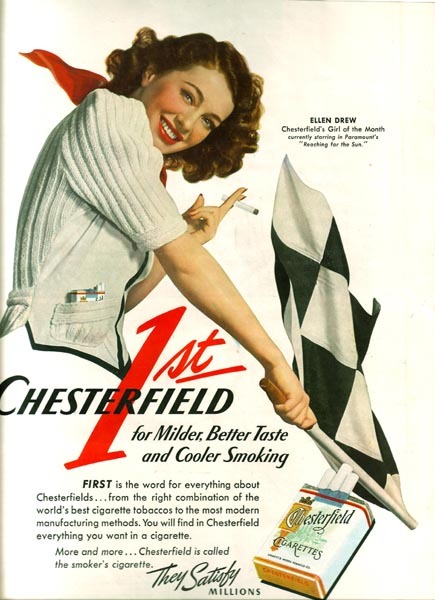 Full color 9 1/4" x 12 1/4" ad shows the Chesterfield Girl of the Month Ellen Drew waving a checkered flag. The ad headline proclaims that Chesterfield is "1st for Milder, Better Taste and Cooler Smoking". This ad is larger than my scanner bed so the outer edges of the ad will not be visible in the scanned view. Full color 9 3/4" x 13 1/2" ad with a photo Sailor Joe Newton lighting up a cigarette while holding the pack in his hand. The ad headline claims that "In the Navy, It's Chesterfield". This ad is larger than my scanner bed so the outer edges of the ad will not be visible in the scanned view. Full color 9 1/2" x 13" ad with A drawing of Angela Cummins - Chesterfield's Girl of the Month. In this drawing she has an opened carton of Chesterfield's in her hand and she is in the process of throwing a forward pass. This ad is larger than my scanner bed so the outer edges of the ad will not be visible in the scanned view. Full color 9 1/2" x 12 1/2" ad that has a photo of actress Claudette Colbert dressed dressed in her Volunteer Army Canteen Service outfit passing Chesterfield cigarettes out to servicemen seated at tables in a large room. The ad headline claims that you can "Keep 'em satisfied with Chesterfield". This ad is larger than my scanner bed so the outside edges are not visible in the scanned view. Full color 9 1/4" x 12" wartime ad with actress Rosalind Russell. The ad has a picture of her acting as an Air Warden. The picture shows her reaching for a pack of Chesterfield cigarettes as the headline gives the "All Clear. That's the Smoker's Signal for a Mild Cool cigarette". This ad is larger than my scanner bed so the outer edges of the ad will not be visible in the scanned view. Full color 9 1/2" x 12" ad with a wartime theme. The ad has a photo of two U.S. Marine Raiders coming out of the jungle with their guns ready and their Chesterfield cigarettes between their lips waiting to be lit. The ad headline says "Watch our smoke...It's Chesterfield for Mildness and Taste". There is a small dirt smudge on this ad that is visible in the scanned view. This ad is larger than my scanner bed so the outer edges of the ad will not be visible in the scanned view. Full color 9 1/2" x 12" ad shows an attractive lady ringing the bell to call the workers in for a meal. The ad salutes the efforts of the U.S. Crops Corps in helping supply food. This ad is larger than my scanner bed so the outer edges of the ad will not be visible in the scanned view. Full color 7 1/2" x 10 3/4" ad that has a picture of Claudette Colbert, Paulette Goddard and Veronica Lake dressed as they appeared in the stirring film So Proudly We Hail. 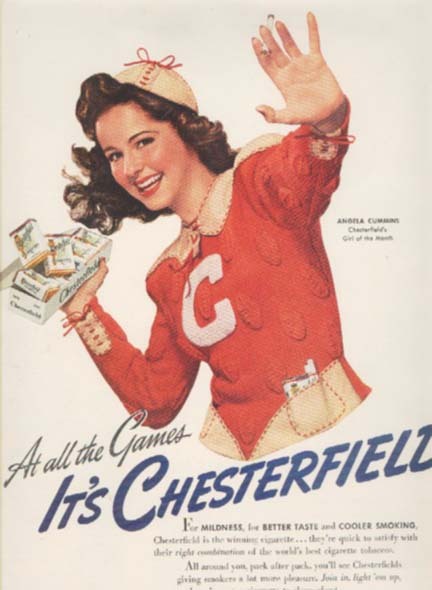 The ad has a banner claiming that "At Home and Over There It's Chesterfield" and the text talks about some of the reasons that Chesterfield was such a popular cigarette. It admits to having Good Tobacco but feels that the real reason is having the right combination of the World's Best Cigarette Tobaccos. At the top of the ad is the urgent plea, "America Needs Nurses...Enlist Now". Full color 10" x 13" ad with a photograph of the Duchess of Windsor. 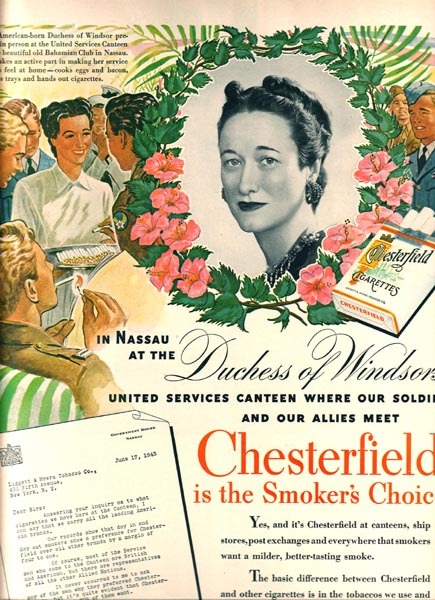 This is a wartime ad with the headline "In Nassau at the Duchess of Windsor's United Services Canteen where our soldiers and our Allies meet, Chesterfield is the Smoker's Choice". This ad is larger than my scanner bed so the outer edges of the ad will not be visible in the scanned view. Full color 10" x 13" ad shows a soldier looking back over his shoulder, smiling and winking at the camera. He has just opened a package of Chesterfield and a letter and picture from his girlfriend. The headline explains that "she knows I'm choosy". This ad is larger than my scanner bed so the outer edges of the ad will not be visible in the scanned view. Full color 9 1/2" x 12" ad for 'good news during the war'. The ad has a picture of a young soldier in uniform ringing the doorbell of somebody's house. Behind his back he hides a bouquet of flowers and a carton of Chesterfield cigarettes to present to the person who opens the door. The ad headline claims he is "Getting there First with the Most". This ad is larger than my scanner bed so the outer edges of the ad will not be visible in the scanned view. Full color 10" x 12 1/2" ad with Bing Crosby. The ad shows Bing sitting in a chair at a desk putting cigarettes into a box. The ad also mentions his new movie "Going My Way". This ad is larger than my scanner bed so the outer edges of the ad will not be visible in the scanned view. Full color 9 1/2" x 12" ad shows a happy man changing from his uniform into civilian clothes. He is smiling as he removes the one thing he wants from the old uniform, his pack of Chesterfields. This ad is larger than my scanner bed so the outer edges of the ad will not be visible in the scanned view. Full color 10" x 12" ad shows a photo of an attractive, well-dressed lady preparing to go out for the evening with her pack of Chesterfield cigarettes protected in a clear plastic box. This ad is larger than my scanner bed so the outer edges of the ad will not be visible in the scanned view. 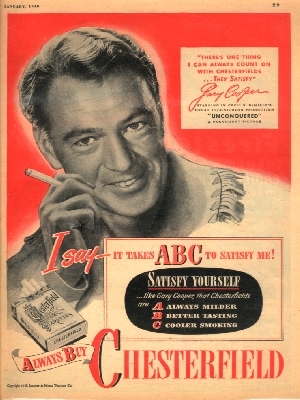 Full color 9" x 12" ad with a picture of a smiling cowboy standing, with his horse behind him, at the entrance to a ranch that has a hanging sign that says A.B.C.. With his left hand he is placing a cigarette between his lips and with his right he is placing a pack of Chesterfield Cigarettes into a pocket on his colorful cowboy shirt. The ad headline has him saying "I always buy Chesterfield. Right Combination - World's Best Tobaccos - Properly Aged". This ad is larger than my scanner bed so the outer edges of the ad will not be visible in the scanned view. Full color 9 1/4" x 12 1/4" ad that shows a smartly dressed man and two ladies all buying Chesterfield cigarettes from a cigarette machine. This ad is larger than my scanner bed so the outside edges of the ad are not visible in the scanned view. Full color 9 1/2" x 12" ad with a photo of a young lady in a pale yellow dress standing in a garden holding a pack of Chesterfield's and smoking another. This ad is larger than my scanner bed so the outer edges of the ad will not be visible in the scanned view. Full color 9 1/2" x 13 1/2" ad with actor Basil Rathbone of Sherlock Holmes fame. This ad, which also mentions his new Sherlock Holmes movie Dessed to Kill has a picture of him lighting a Chesterfield with a match with the caption "Yes! it's Elementary". In a tribute to the detective there are two magnifying glasses with a red lens and the letters "ABC" inside. 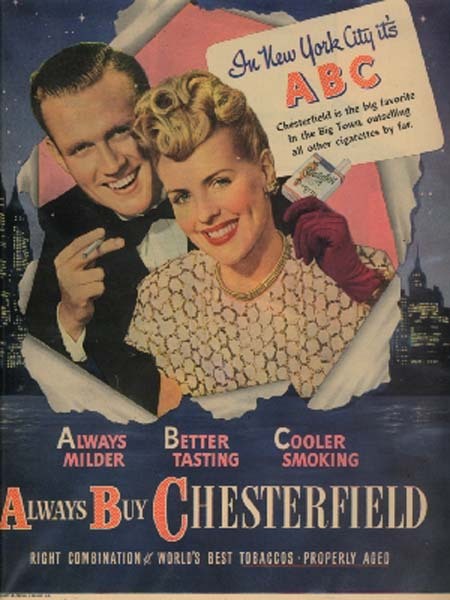 As usual the ad gives several versions of what the letters stand for, in one it says "A Always Milder, B Better Tasting, C Cooler Smoking" and in the other it says "Always Buy Chesterfield" as it claims they have the "Right combination of the World's Best Tobaccos Properly Aged". Full color 9 1/2" x 13 1/2" ad for Chesterfield cigarettes in their Christmas carton. There is a picture of a jolly Santa holding up a string of garland with a new message using the ABC that Chesterfield is so famous for, this message is for all of you Santas out there, it says Always Bring Chesterfield. The cartons shown have a smaller picture of the Santa in this ad on them and the caption urges you to "Top off your gift bundles with these cheery cartons of Christmas Chesterfields...They Satisfy.". The ad also reminds us that these cigarettes are made from the "Right Combination - World's Best Tobaccos - Properly Aged". Full color 9 1/2" x 12 1/2" ad with a picture of a crowded restaurant where a Cigarette Girl, who only has Chesterfield, is making a sale to two well-dressed couples. The ad headline makes the statement that "East and West Agree on A-B-C 'Chesterfield is by far our largest selling Cigarette'. Sherman Billingsley's Stork Club in New York and Robert H. Cobb Hollywood's Brown Derby". This ad is larger than my scanner bed so the outer edges of the ad will not be visible in the scanned view. Full color 10" x 13" ad for Chesterfield cigarettes with popular actor Gregory Peck. The ad shows a smiling Peck in western clothes and mentions his new movie "Duel in the Sun". Full color 9 1/2" x 12" ad for the new Red, White and Blue packaging being used by Chesterfield. The ad has a drawing of a king putting the ashes of his cigarette into a nearby Top Hat while a Jester hands another carton to him. The ad headline has him saying "3 Cheers for the Red, White and Blue...The new class in Cartons". This ad is larger than my scanner bed so the outer edges of the ad will not be visible in the scanned view. Full color 9" x 13" ad with popular comedian Bob Hope as he speaks out for Chesterfield Cigarettes. 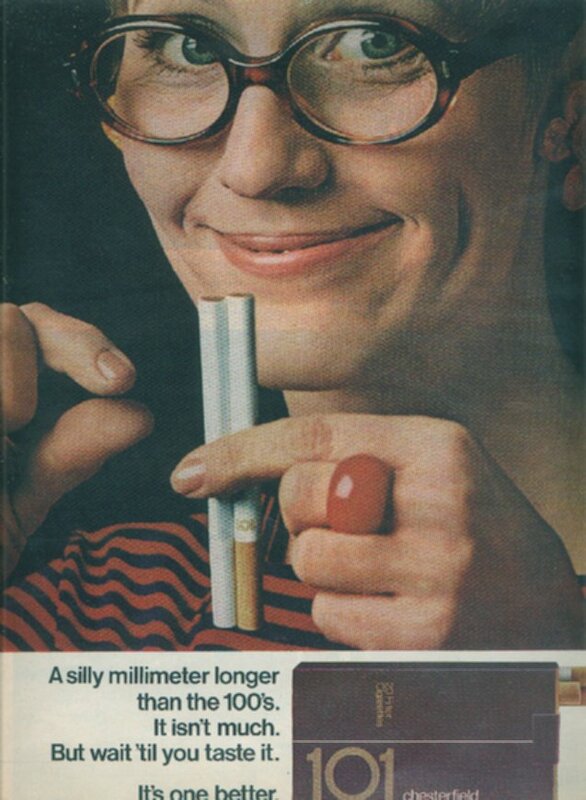 The ad has him pictured holding up a pack of this product from which three cigarettes of different lengths are protruding. The caption is saying that "Dorothy Lamour is "My Favorite Brunette"...Chesterfield is my favorite cigarette". Another portion of the ad identifies My Favorite Brunette with Dorothy Lamour as being his new picture. 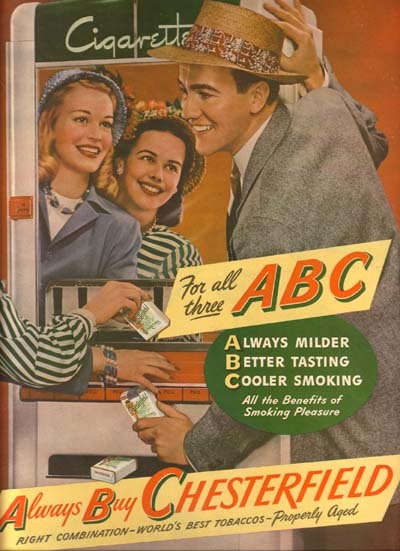 The ad tells that "A" meaning Always Milder, "B" meaning Better Smoking and "C" meaning Cooler Smoking is "The sum-total of smoking pleasure". Full color 7 1/2" x 10 1/2" ad with actress Dorothy Lamour. The ad also mentions her new movie "Wild Harvest". 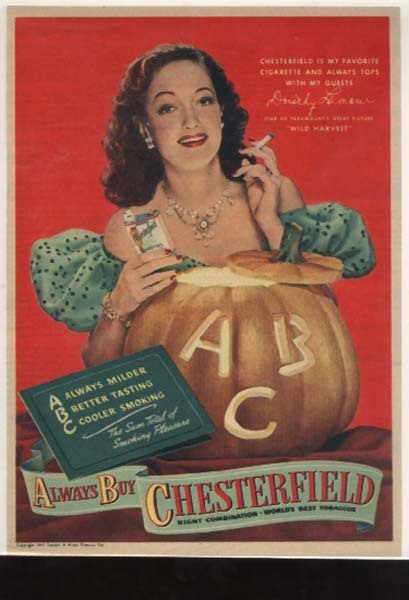 In keeping with the Halloween season the ad shows Miss Lamour standing behind a pumpkin with "ABC" carved into it. Three color 10" x 13" ad with a picture of singer Rise Stevens. 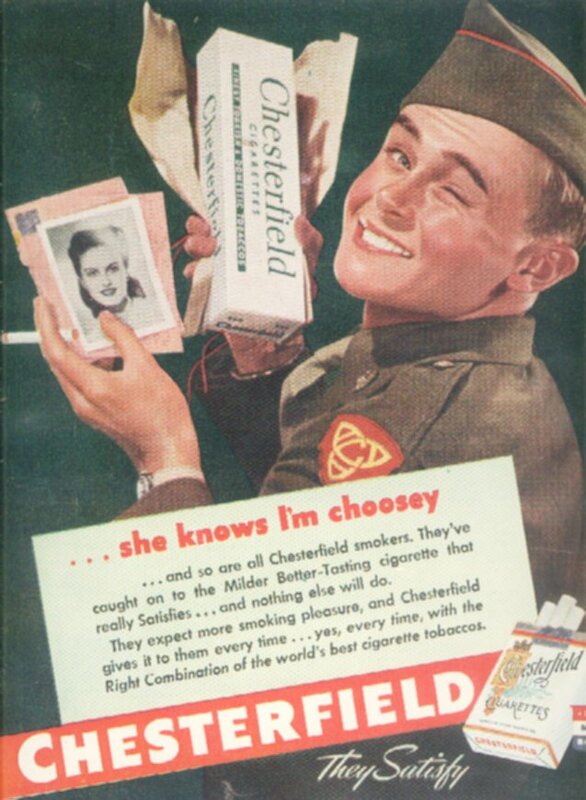 There is a picture of her resting the hand that holds a lit Chesterfield against her cheek and saying "You might say I'm careful, that's why I say Chesterfields satisfy me!". The ad identifies her as Metropolitan Opera's World Famous Carmen and has the famous phrase "I say - it takes ABC to satisfy me!" Full color 9 1/2" x 12 1/2" ad with Ronald Reagan. 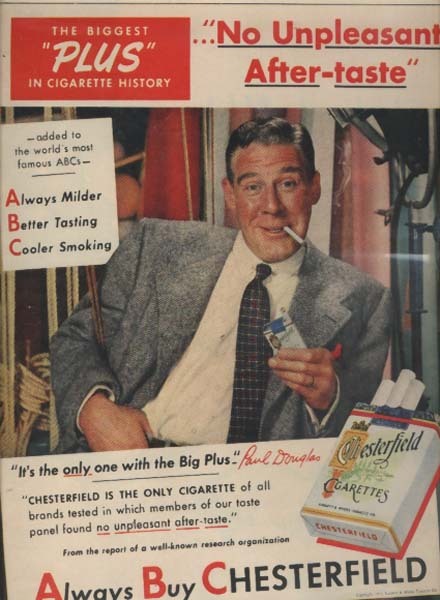 The ad has a photo of the actor / President-to-be holding an opened pack of Chesterfield in his left hand while holding a lit cigarette between his lips. The ad headline has him saying "My cigarette is the MILD cigarette...that's why Chesterfield is my favorite". This ad is larger than my scanner bed so the outer edges of the ad will not be visible in the scanned view. Three color 9 1/2" x 13" ad for the greatest gift of all, Cartons of Chesterfield. 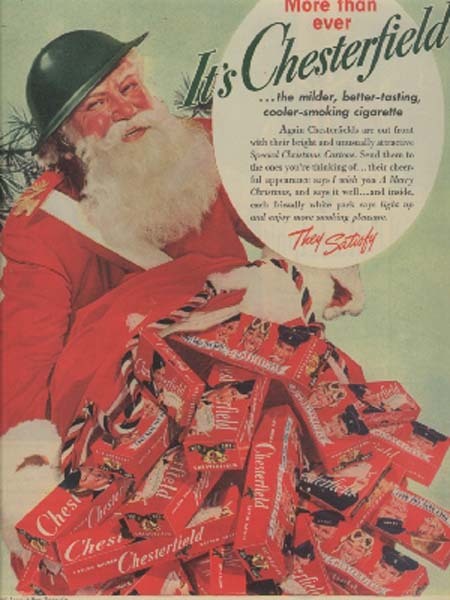 The ad has a picture of Arthur Godfrey dressed as Santa Claus holding stockings stuffed with Chesterfield. The ad headline asks you to "Sock 'em with a Load of Good Cheer". This ad is larger than my scanner bed so the outer edges of the ad will not be visible in the scanned view. Full color 9 1/2" x 13 1/2" ad with actress Joan Fountaine. 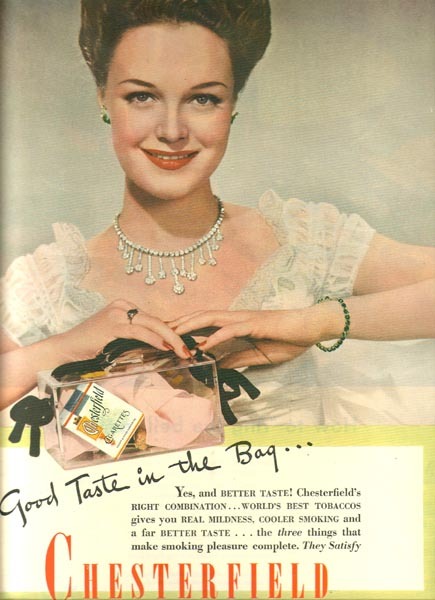 The ad has a large photo of the starlet wearing a black top and hat with a pearl necklace as she holds up a pack of Chesterfield cigarettes while saying "In my home, guests always insist on Chesterfields because they're so MILD". The ad mentions that she is starring in the movie You Gotta Stay Happy with James Stewart and the ad encourages you to "Make Yours the Milder cigarette"
Full color 9 1/2" x 13 1/2" ad with a photo of actor John Lund holding a lit cigarette. The ad headline has him saying "When you smoke Chesterfield you get a Milder cooler smoke - that's why it's my cigarette". This ad is larger than my scanner bed so the outer edges of the ad will not be visible in the scanned view. Full color 10" x 13 1/2" ad with actress Mona Freeman. There is a picture of her wearing a gold top with a red scarf holding a pack of Chesterfield in one hand while the other holds a lit Chesterfield and asking that you "Make the Mildness test and you'll smoke Chesterfields like I do". The ad explains that the Mildness test is to Open 'em, Smell 'em, Smoke 'em. The ad mentions that she is appearing in the movie Branded with Alan Ladd and a smaller photograph is a backstage shot of the two of them resting on a couch together, both smoking Chesterfield..
Full color 10" x 13" ad with actress Donna Reed. In this ad Donna appears with John Derek and the ad also mentions the movie they are appearing in Saturday's Hero. This ad is larger than my scanner bed so the outer edges of the ad will not be visible in the scanned view. Full color 10" x 13" ad with actress Anne Baxter The ad has a picture of her wearing a red dress with a black and pink collar holding a pack of Chesterfield cigarettes in the same hand that holds a lit Chesterfield. The headline says " For You Proof of Mildness with no unpleasant after-taste" and has her saying "Prove for yourself Chesterfields are milder - they're tops with me". The ad mentions that she is starring in the movie Follow The Sun which is the life story of golfer Ben Hogan and has another picture of him backstage giving her pointers in golf. It mentions that he also smokes Chesterfield. Full color 10" x 13" ad for Chesterfield cigarettes. Ad also mentions his new movie The Guy Who Came Back. This ad is larger than my scanner bed so the outer edges of the ad will not be visible in the scanned view. Full color 9 1/2" x 14" ad with Janis Carter and Jack Buetel for this popular cigarette. 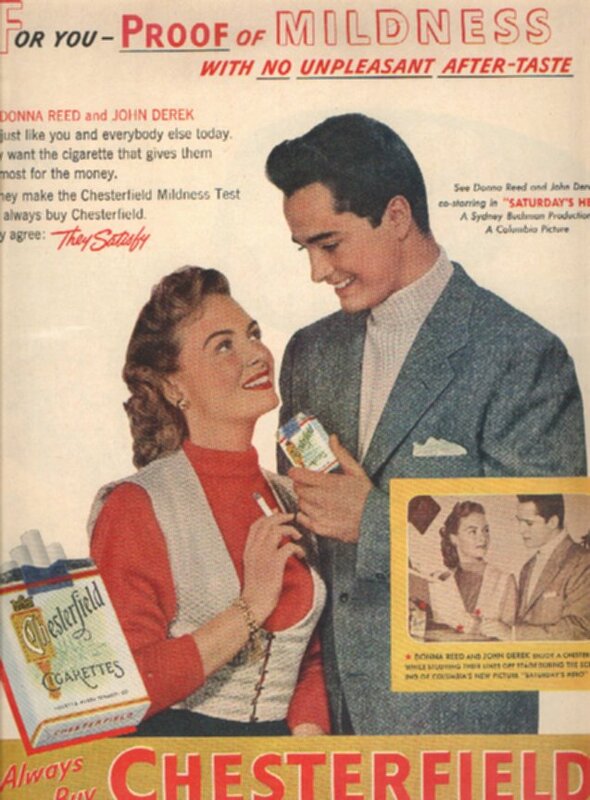 There is a picture of these two getting ready to smoke a Chesterfield as the headline makes the claim that "All over America - Smokers are changing to Chesterfield". One banner contains the claim from the owner of the RKO Smoke Shop who says that "I certify that at my RKO Smoke Shop Chesterfield is our largest selling cigarette by 3 to 1". The ad claims that this popularity is because Chesterfields are Much Milder. Full color 7 3/4" x 10 3/4" ad for the "First Cigarette to name All its ingredients". 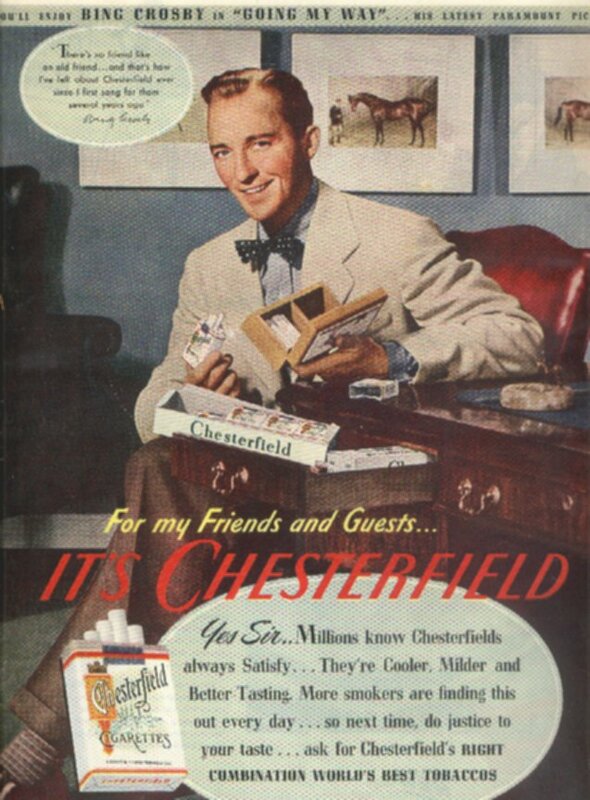 This ad has a very large picture of a pack of Chesterfield Cigarettes and the headline claims that "The Spotlight's on Chesterfield". The text talks about the ingredients being natural and "entirely safe for use in the mouth". Full color 8" x 10 3/4" ad that shows their Christmas Carton and announces that it is the "First Premium Quality Cigarette to offer Both Regular & King-Size". On a snow-covered background we see exampes of both packs and the carton with the words "Chesterfield on the Tree for Christmas" and a gift tag thoughtfully printed on the carton. They call it "The Ideal Gift - Regular or King-Size" because it is "Much Milder". Full color 10" x 14" ad that tries to provide Medical Proof that smoking Chesterfield is closer to being good for you than any other cigarette. At the top of the ad, in large block letters, is the claim that "Nose, Throat and Accessory Organs not Adversely Affected by Smoking Chesterfields" and tlaims that this is the "First such report ever published about any cigarette". The text begins by giving the credit for this information to "A responsible consulting organization" and goes into detail about how the test was organized. At the beginning of a six month period a group of people were given a physical including X-rays and then the entire group was allowed to somke only Chesterfields, 10 to 40 a day, and were reexamined when the test period was over. The examinations showed "no adverse reactions" which is the basis for this claim. At the bottom of the ad is a picture that shows a pack of the regular Chesterfield and the King-Size Chesterfields. Full color 10" x 13 1/2" ad that tells us that Chesterfield cigarettes are the thing to choose for Christmas. Under the headline "Wrapped And Ready!" 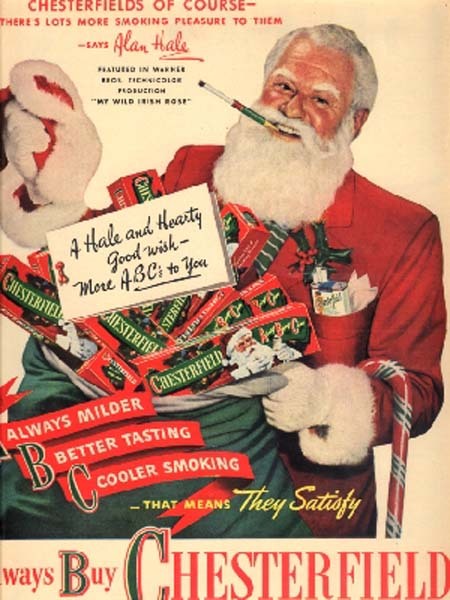 is a drawing of a beleagured Santa Claus holding up a carton of Chesterfield cigarettes as he is wrapped up in a mess of white tape that goes around him, several times, and spells out the word Chesterfield on the carton. The rest of what has been spelled out says that it is "To Put A Smile In Your Smoking". Full color 5" x 13" ad for their King Size Cigarettes. This is another of their Men of America series. This ad has pictures of a Missile Engineer, showing him working on his job of launching missiles and relaxing afterward with a Chesterfield. The ad headline tells you to "Join the men who know - Nothing satisfies like the big clean taste of Top-Tobacco". This ad is taller than my scanner bed so the outer edges of the ad will not be visible in the scanned view. Black and white 9 1/2" x 13 1/2" ad that has a picture of a male hand holding a lit Chesterfield cigarette horizontal to the reader while the headline is saying "Only in Chesterfield...Big Clean Taste of top-tobacco end to end now Air-Softened by new top-porosity paper!" Beneath the picture are the words "And - if you're smoking King-size, as 2 out of 3 smokers now do, you owe it to yourself to taste today's Chesterfield King". The ad also shows another view of this cigarette, still burning, with descriptions on the top and the bottom of it, with a stamp saying "Straight Grade A Top-Tobacco" with the bottom headline calling this the "Best Tasting Smoke In The U.S.A.". Full color 9 3/4"x 13" ad with a picture of a man seemingly hiding behind a row of Chesterfield King Cigarettes with one lit, supposedly the one taken from the fence. The text that is next to him says "If you can smoke for pleasure and not just from habit, smoke the cigarette that really satisfies". The big headline says that "21 Great Tobaccos make 20 Wonderful Smokes" and it goes from there what "Pleasure" really is. It says that "Pleasure's True - Twenty-one great tobaccos - vintage tobaccos - are grown milk, aged mild, blended mild - not filtered mild in a Chesterfield King". Then it is "Pleasure's Long - Nothing satisfies like the great taste of great tobaccos blended mmild. And you get King-size flavor in the long, long length of the King". And last we have the "Pleasure's Filter Free - The goodness of 21 great tobaccos is not lost in a filter - all the flavor gets home to you. Enjoy the true satisfaction of this true cigarette". They also say that "The same great tobaccos are in both Chesterfield and Chesterfield King. They satisfy!". Full color 10" x 13 1/2" ad for Chesterfield cigarettes that offers "21 Great Tobaccos make 20 Wonderful Smokes!". We see a picture of a formal evening where two men in suits, standing facing each other with a lit cigarette in their mouths, and a smiling woman, somewhat shorter than the men, who is holding a lit Chesterfield as she is looking at the taller of the two men. The three cigarettes seem to have come from the lineup of 17 cigarettes, the three that they are smoking would make 20 to be a full pack, that are standing next to the pack of Chesterfield in the right corner. The words in the bottom of the ad begin with the words "Pleasure's True", "Pleasure's Long" and "Pleasure's Filter-Free". Full color 9 1/2" x 13" ad for their Chesterfield King Cigarettes. The ad has a picture of a lady lying on her back on a beach smoking a Chesterfield while a man lies next to her smoking his own Chesterfield. The ad headline claims "This is tobacco too mild to filter. This is pleasure too good to miss. This is Chesterfield King". One interesting note is that the lady's head is resting on a folded blanket with a New York Yankee cap next to her head. This ad is larger than my scanner bed so the outer edges of the ad will not be visible in the scanned view. Full color 9 1/2" x 12 1/2" ad for their King Size Cigarettes. There is a large picture of a man with a red and black coat on, a lit Chesterfield between his lips and a smile on his face and the caption says "Tastes Great because the tobaccos are!" The headline next to the picture of the pack tells us that "21 Great Tobaccos make 20 Wonderful Smokes" and, in the lower right corner of the ad, we see a comparison between the length of an "ordinary cigarette" and a Chesterfield King. Full color 9 1/2" x 13" ad for their King-Size Cigarettes. The ad has a picture of a man wearing a tweed coat and smiling as he puffs away on the Chesterfield that he holds between his lips. The ad headline claims that it "Tastes Great because the tobaccos are!" and that "21 Great Tobaccos make 20 Wonderful Smokes!". There is a comparison photo that shows how much longer the Chesterfield King is than an ordinary cigarette. This ad is larger than my scanner bed so the outer edges of the ad will not be visible in the scanned view. Full color 9 1/2" x 13" ad for their King Size cigarettes with the longer length. The ad has a picture of a young man wearing a yellow hooded coat who is standing with a smile on his face and a cigarette between his lips. 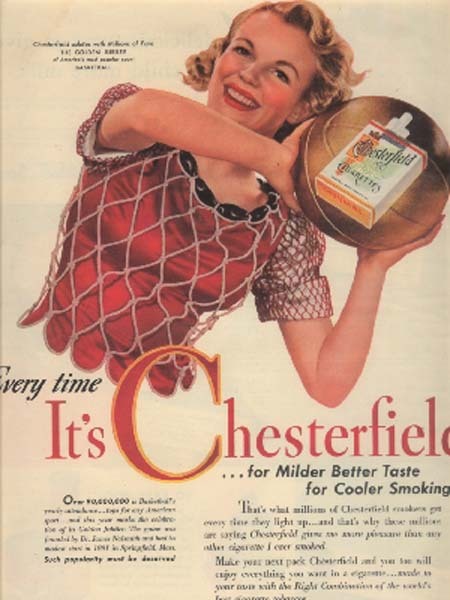 The ad headline claims that Chesterfield "Tastes Great because the tobaccos are!" and the ad includes another claim that "21 Great Tobaccos make 20 Wonderful Smokes!". This ad is larger than my scanner bed so the outer edges of the ad will not be visible in the scanned view. Full color 9 1/2" x 12" ad with the claim that it "Tastes Great because the tobaccos are!" There is a photo of a smiling man with red hair and a ruddy complexion holding a cigarette between his lips. The ad headline claims that "21 Great Tobaccos make 20 Wonderful Smokes" and the text mentions the Longer Length which goes along with the Milder Taste..
Full color 9 1/2" x 13" ad for the Chesterfield King. 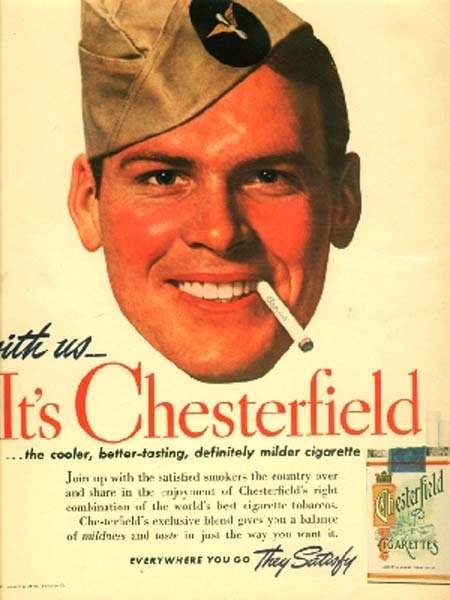 There is a picture of a man with a tight-lipped smile holding a lit Chesterfield in his mouth with the headline claiming that it "Tastes Great because the tobaccos are!". The text tells us that the "21 Great Tobaccos make 20 Wonderful Smokes" and there is a comparison picture that shows hos much longer the Chesterfield King is than an "ordinary cigarette". Full color 9 1/2" x 12" ad with a photo of a blonde headed, athletic-looking young man wearing a sweatshirt and smoking a Chesterfield cigarette. The ad headline claims that "21 Great Tobaccos make 20 Wonderful Smokes!" and that it "Tastes Great because the tobaccos are!". This ad is larger than my scanner bed so the outer edges of the ad will not be visible in the scanned view. Full color 9 1/2" x 13" ad for their Chesterfield King Cigarettes. The ad has a picture of a young man wearing a red shirt and holding a lit Chesterfield between his lips as he squints and smiles at the camera. The ad headline claims that it "Tastes Great because the tobaccos are!" and explains that "21 Great Tobaccos make 20 Wonderful Smokes. This ad is larger than my scanner bed so the outer edges of the ad will not be visible in the scanned view. Full color 9 1/2" x 13 1/2" ad for the kind of adventuresome man who smokes Chesterfield. The big picture in the ad shows this smiling man looking at the camera with a Chesterfield placed loosely in his mouth or it could be that the cigarette has been placed in the spot of a missing tooth. The four pictures on the side show two men climbing cliffs and sitting high up on the edges. Another picture shows the pack with the numbers 21 and 20 above it and the last picture shows the two mountain climbers leaning on a car and talking to a pretty girl who is sitting inside. The headline claims that Chesterfield "Tastes Great because the tobaccos are!" and the text talks about the 21 great tobaccos that make 20 wonderful Chesterfield Kings. Full color 9 1/2" x 12 1/2" ad has several photos that show different scenes of a man and a woman who are in the process of snow skiing. There is a larger photo of the man who has stopped to light his cigarette while still wearing his goggles. The ad headline claims that the cigarette "Tastes Great because the tobaccos are!". This ad is larger than my scanner bed so the outer edges of the ad will not be visible in the scanned view. Full color 9 1/4" x 13" ad with a Fishing theme. The ad has several photos of a couple Bone Fishing at the Grand Bahama Island. As they are fishing they are enjoying their Chesterfield cigarettes which, according to the headline, "Tastes Great, Smokes Mild". This ad is larger than my scanner bed so the outer edges of the ad will not be visible in the scanned view. Full color 10" x 13" ad for more of the Chesterfield People. Under the statement that "They like a mild smoke, but just don't like filters. (How about you?)" are pictures of three people smoking at their day jobs. There is Sidney Milan, stockbroker in New York there is Howard G. Heston a rancher in Arizona and Francelle Metzenberg who was an Interior Decorator in Illinois. The text claims that this is the "mildest-tasting Chesterfield in 51 years" and that it is "Made to taste even milder through longer length". This ad is larger than my scanner bed so the outer edges of the ad will not be visible in the scanned view. Full color 9 1/2" x 12 1/2" ad for their King Cigarettes. This ad is one of their "Chesterfield People" ads and has photos of Ernest F. Fetske, Boat Designer, Jean Russell, Concert Pianist and Richard N Pidge, Mining Engineer. The ad headline claims "They like a mild smoke, but just don't like filters. (How about you?)". Full color 10" x 13 1/2" ad that shows three more of the "Chesterfield People". Shown are Richard J. Gail, an automotive performance engineer from Ohio, Virginia Van Brunt, who is a fashion consultant from New York and Robert E. Peay, who is a criminal investigator from Maryland. It is said of these people that "They like a mild, smoke, but just don't like filters. (How about you?)". The last words in the ad tells us that "Chesterfield King tastes great...yet it smokes so mild!". Black and white 9 1/2" x 13" ad for the kind of people who smoke Chesterfield cigarettes, "Chesterfield People". 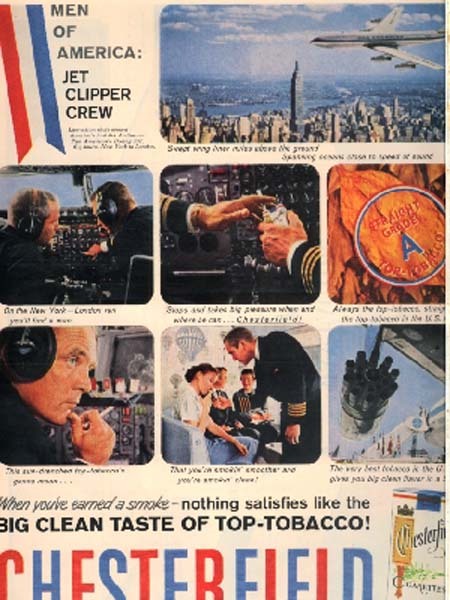 The ad has three pictures of successful people and their Chesterfields; there is Paul A. Johansen, a shipping lines port captain from New York, Mrs. Lee McCarty who is a potter from Mississippi and Robert E Peay, a criminologist from Maryland. The text claims of these people that "They like a mild smoke, but just don't like filters. (How about you?)". This ad is larger than my scanner bed so the outer edges of the ad will not be visible in the scanned view. Black and white 10" x 13 1/2" ad that shows three more Chesterfield People and how "They like a mild smoke, but just don't like filters. (How about you?)". Pictured in this ad are Randall A. Gamon, paint tester, Florida, Joan Lakow, pattern designer, New York and Nelson Reed, archeologist, Missouri. The ad claims that "If you like a mild smoke, but don't like filters, try today's Chesterfield King - mildest-tasting Chesterfield in 52 years. Vintage tobaccos - grown mild, aged mild, blended mild. Made to taste even milder through longer length. They satisfy". Full color 10" x 14" ad that is another in their series: Chesterfield People. The ad describes these people: "They like a mild smoke, but just don't like filters. (How about you?:. Shown in this ad are Floyd Stromme, a grain and stock farmer, Mrs. Lee McCarty, a potter and James S. Thompson, an optical physicist. They claim these are the "mildest tasting Chesterfield in 52 years" and the Chesterfield King "tastes great...yet it smokes so mild!" Black and white 10" x 13 1/2" ad that is another ad that discusses three of the Chesterfield People. It mentions that "They like a mild smoke, but just don't like filters. (How about you?)". The three people shown in this ad are Larry Craig Dean, architect, Georgia, next is Virginia Van Brunt, fashion consultant, New York and the third one is Theodore J. Miller, dog breeder, Wisconsin. There are three pictures of smokers and the fourth is an opened package if Chesterfield sitting on a table. The ad tells us that "If you like a mild smoke, but don't like filters, try today's Chesterfield King - mildest-tasting Chesterfield in 52 years. Vintage tobaccos - grown mild, aged mild, blended mild. Made to taste even milder through longer length. They satisfy". Full color 9 1/4" x 13" ad that talks about Chesterfield People. Shown in the ad, as smokers of Chesterfield cigarettes, are a Fashion Columnist from Minnesota, a Mining Engineer from Nevada and a Sculptor from Mississippi. This ad is larger than my scanner bed so the outer edges of the ad will not be visible in the scanned view. Full color 9 1/2" x 12 1/2" ad for some more of the Chesterfield People. Shown in the ad are Mary Percy Schenck, a costume designer from Pennsylvania, James S. Thompson, an optical physicist from California and Charles Feingarten who is an art gallery director from Illinois. These are all people who "...like a mild smoke, but just don't like filters. (How about you?)." This ad is larger than my scanner bed so the outer edges of the ad will not be visible in the scanned view. Full color 9 1/2" x 13" ad for the variety of people that are known as Chesterfield People. Shown in the ad, at their places of work, are Annette Boorde who is an executive secretary in Virginia, Nelson Reed who is an archeologist from Missouri and William C. Bettendorf, Jr. who is a general contractor from Massachusetts. These people like a mild smoke, but just don't like filters. (How about you?) The text claims that it is made to taste even milder through longer length and that it "Tastes great...tastes mild!" Black and white 10" x 13 1/2" ad that shows us three more of the "Chesterfield People". It claims that "They like a mild smoke, but just don't like filters. (How about you?)". Shown are Richard Brown who is with brokerage firm in New York, Jeanne Sully who is a fashion designer in California and Edward R. Sullivan who is a foreman of a waterworks in Massachusetts. The ad concludes with the saying that "If you like a mild smoke, but don't like filters, try today's Chesterfield King - mildest-tasting Chesterfield in 52 years. Vintage tobaccos - grown mild, aged mild, blended mild. Made to taste even milder through longer length. They satisfy!" Full color 10" x 12 1/2" ad that discusses "Chesterfield People". 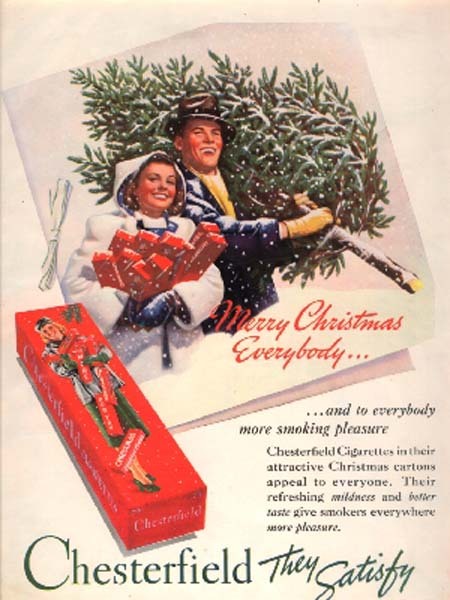 The ad pictures and describes Chesterfield smokers Richard Brown, Jeanne Sully and Edward R. Sullivan. This ad is larger than my scanner bed so the outer edges of the ad will not be visible in the scanned view. Full color 10" x 14" ad that brings out attention to "Chesterfield People" and reminds us that "They like a mild smoke, but just don't like filters. (How about you?)" The three people that are named in this ad are Finn Gurholt, a chef at a resort in Utah, Malcolm W Frasier, a man who distributes marine supplies in Massachusetts and Marion Brand, a cruise ship hostess from Pennsylvania. 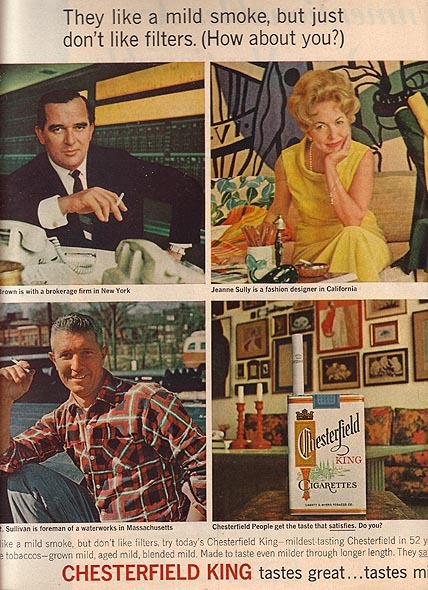 The fourth picture in the ad has a shot of a pack of Chesterfield King cigarettes that has the message that "Chesterfield" People get the taste that satisfies. Do you?" Full color 10" x 14" ad that is another in their "silly millimeter" ads. The ad shows a portly man holding two cigarettes in his hand. He has them equal at the bottom and the one cigarette is just a little bit longer at the top. He is indicating how long by holding two fingers on the other hand just a bit apart. He has a silly grin on his face as he indicates this distance. The ad says their cigarettes are "A silly millimeter longer than the 100s. It isn't much. But wait til you taste it. It's one better." There is a picture of a pack of this cigarette lying on it's side with a cigarette or two pulled out of the pack. Full color 10" x 13" ad for Chesterfield 101. The ad has a photo of a smiling lady holding a 101 cigarette up next to one that is just 100 millimeters long. The text of the ad explains "A silly millimeter longer than the 100's. It isn't much. But wait 'til you taste it". This ad is larger than my scanner bed so the outer edges of the ad will not be visible in the scanned view. 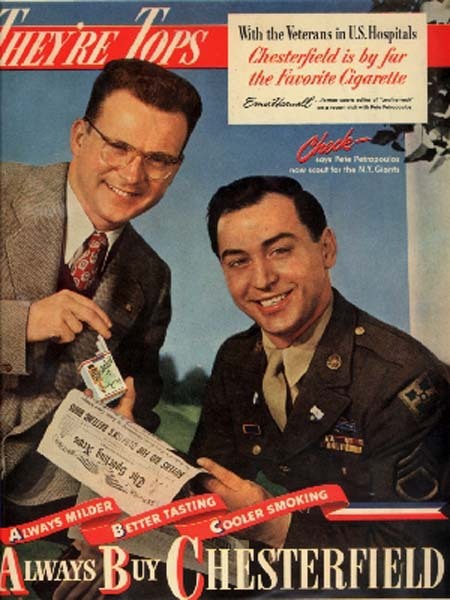 Full color 10" x 13" ad shows a smiling man holding up two cigarettes of different lengths and holding his thumb and forefinger about the same distance apart. The ad headline says that the Chesterfield 101 is "A silly millimeter longer than the 100's. It isn't much. But wait 'til you taste it". It then finishes by saying that "It's one better".